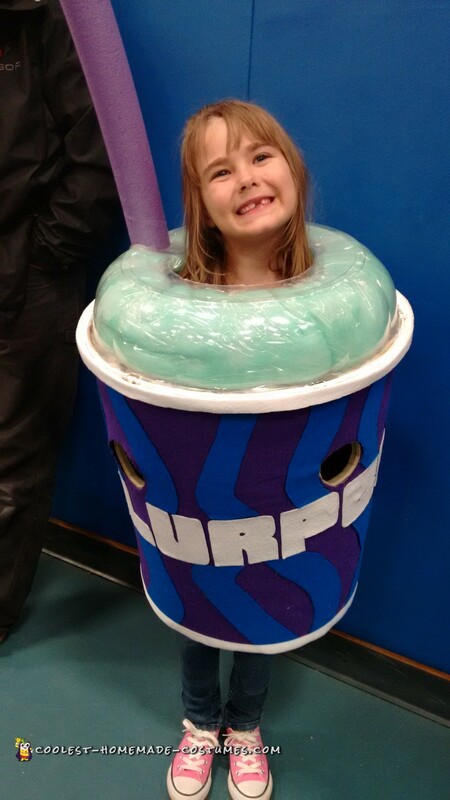 Since we are a family of Slurpee junkies, what more fitting than a homemade Slurpee costume? Sure, anyone can purchase a ready made costume and put it on, but where is the originality in that? The hardest part was coming up with the best materials to bring it together. For the cup, it is 2 different sized wooden embroidery hoops with semi rigid upholstery foam which was excellent to use, because it can be caved in and bounce back, and stand up by itself without falling over. We opened up an actual cup to see how to cut the foam.and used spray foam adhesive to glue the seam after methodically rolling and gluing it to the embrodiery hoops, then covered it with felt. The Slurpee logo I freehanded onto card stock for my stencil from a blown up logo I printed off the internet (the font was called Brain freeze). It was much easier than I thought to draw them out, then used the stencils to cut out the felt, which were then glued onto the cup felt. The dome lid is actually a left over cupcake dome from 2 dozen cupcakes I had purchased from the local Walmart bakery with a hole cut in the center for her head. I sprayed polyfill with the ‘blue raspberry’ colored hairspray, let it dry, wrapped it in saran wrap in a long flat ‘sausage shape’, then used clear tape to tape it around the hole inside the dome. We affixed the dome to the cup my poking holes about every 1 inch or so around the top ring of the foam and drilled tiny holes roughly the same spacing in the base of the plastic dome and threaded very small zip ties though and cinched each one down, snipping off the rest. The dome did have a lip on the edge I couldn’t get flush with the cup so I glued a piece of rubber weather stripping around the rim of the top edge of the cup, that made for a relatively smooth appearance. Both the bottom and top rings of the cup were lastly covered with strips of white strap material, to give it a more finished look. We then cut a hole in the dome to fit a pool noodle for the straw. The whole cup can sit directly on the shoulders, but we stapled some straps to the inside of the top embrodery hoop in a V shape so it didn’t sit directly on her shoulders. Lastly, we cut holes in the cup all the way through the felt and the upholstery foam for arm holes. This is the second year she has worn it, and gets a gazillion compliments. Can’t wait to come up with next years idea!